I just love your bags! They are so well made and durable! I have my summer bag now. Will be back to shop in the fall. This is my second bag from Monday Morning. I LOVE this bag. Everything about it is perfect and craftmanship is beautiful. 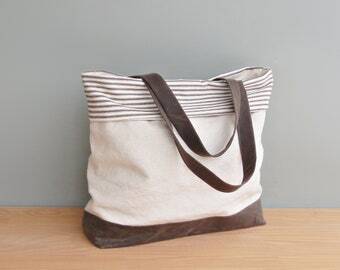 These waxed canvas totes are accented with a strip of gorgeous fabric or faux fur! 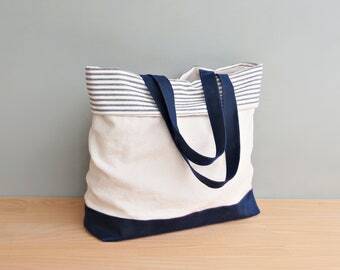 My best seller - a versatile convertible folover/tote bag! I design each bag. Many calculations and recalculations are required to make sure the design is of pleasing proportions, functional, and uses fabric efficiently. Then I make a prototype, tweak it, make another, tweak that one, and so on until it is perfect. I acquire fabrics by combing the web for end of run and discontinued high-end upholstery fabrics and suppliers of quality yardages. It's a time consuming process requiring many swatches, but it is the best way to provide gorgeous fabrics at reasonable prices. I acquire the hardware. I spend a lot of time sourcing and testing my hardware for durability as cheap bag hardware and leather makes me sad. I love to provide custom strap options to make each of my customers' bags a perfect fit. I sew, sew, sew! Luckily, I have found several talented local seamstresses with the same standards of quality as I who help construct linings for me. Mixed in there is photographing and listing each bag and the seven thousand other tasks necessary to run a small business. This is the least fun part, but definitely worth it to be able to spend my day making beautiful bags. Monday Morning Studios is located in the farmlands of northern Maryland. All the bags in my shop are designed and created by me in my smoke free, pet free workroom. I use the highest quality fabrics and the coolest quality embellishments to create unique pieces for those who appreciate such things. Please review the item photos and descriptions before purchasing. Measurements and details of each bag are included to allow you to make an informed purchase. I do not accept returns on custom bags. 1.) Contact must be made at http://www.etsy.com/convo_new.php?to_username=MondayMorningStudios within three days of shipment arrival. 6.) Returns are not accepted for custom items. A bag is considered custom if a change is made other than what is available from the listing drop down menus. If you have a question about what constitutes a custom bag, please contact me. Please let me know if there is any problem with your order. 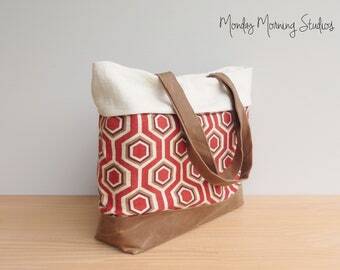 I want everyone who carries a Monday Morning bag to also wear a smile! if you have trouble with checkout or another issue, and I will be glad to hold the item for a short time for you. All my bags are made by me upon order. Most bags ship in 1-3 business days. Occasionally an order may take longer, so please let me know if you have a deadline to receive your bag. Items shipped in the US are shipped via Fed Ex Home Delivery or USPS Priority Mail. Express shipping is available. International shipping is USPS First Class International Mail. Customs duties are the responsibility of the buyer. Shortly after purchase, you will receive a confirmation convo from me to thank you for your business and let you know the approximate shipping date. When your order ships, if the mailing address is in the US, you will receive an email letting you know the exact shipping date and a tracking number (if available). Don't forget... all customs duties, fees, and any other additional international shipping costs are the responsibility of the buyer. Please contact me at http://www.etsy.com/convo_new.php?to_username=MondayMorningStudios for additional or different shipping options. I offer bulk discounts. Please contact me for pricing info. I do not do consignments, craft shows or trades at this time.